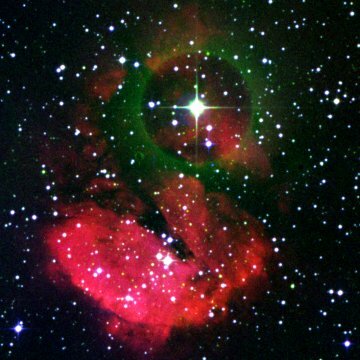 This bubble, most commonly called RCW 120, is ionised by the O8 V star CGO 439. Distance estimates consistently place it relatively close by (about 1340 pc) in the Sagittarius arm. This HII region has been examined in detail in papers by Zavagno et.al. and Deharveng et.al. , who found significant new star formation underway at the edges of the bubble. According to Avedisova, RCW 120 is ionised by the O8 V star CD -38 11636 (CGO 439) and the B2 V star VDBH 84B. She places the nebula in the star formation region SFR 348.26+0.47 along with 3 masers and the radio HII region [CH87] 347.386+0.266. A 2005 study refers to the Avedisova paper and gives the class of the main ionising star as O6 V, so the star may be hotter than Avedisova suggests.